Findon Cricket Club were dumped out of the Gray-Nicolls T20 Cup in a low-scoring clash at Sussex League Division 3 West rivals Stirlands on Sunday. 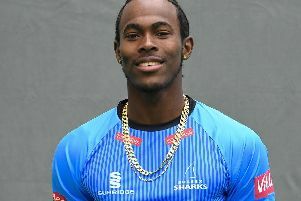 Skipper Bradley Bridson, who missed the game through injury, watched on as his side slipped to a two-wicket defeat in the rearranged first round encounter. Findon almost managed to defend their total of 89 but a crucial knock of 47 not out from Stirlands overseas Jamaine Bullen guided his team to victory with just two balls to spare. Opening bowler Harrison Grayton’s effort of 4-17 - which included three wickets in a single over - nearly helped Findon record an unlikely win but they came up short. Findon skipper Bridson counted the cost of a below-par total following the defeat. He said: “The track looked a road but we quickly realised a total of around 120 would have been a good one. “If we had managed to get another 20 or 30 runs I think we would have won the game. “It was never going to be a competition we were going to win but it would have been nice to get through a round at least. We’d have played Premier League Roffey in the next round, who I think have won the league four of the last five years, so it would have been nice to test ourselves against them. Findon found it difficult to score at a steady rate throughout their innings after stand-in skipper Curtis Howell decided to bat first. Just four Findon batters, opener Liam Freeman (ten), innings top-scorer Glenn Bridson (18), Graham Manser (16) and an unbeaten 17 from Sam Dunkley, managed to reach double figures as the visiting team managed to post 89-6 off 20 overs. George Briance starred for Stirlands with the ball, putting the squeeze on Findon bagging figures of 3-11 off his four overs. Grayston blitzed through Stirlands’ top-order getting rid of openers William Gubbins (nought), Briance (one), along with skipper George Coles (six) and Jake Moores (nought) to leave the home side in real trouble. Overseas Bullen played a key knock, ending unbeaten on 47, to guide Stirlands to a two-wicket win as they reached 90-8 with just two balls of the innings remaining. Findon entertain rivals Steyning in the Division 3 West on Saturday. n Findon’s league match at West Chiltington & Thakeham was abandoned last Saturday.